Maybe you’re in it for writing advice. Or maybe you want to know what your favorite writers do in their actual lives. Maybe you just need a distraction and want to look at cats, food, or cartoons, but also want feel a little intellectual while you’re at it. Don’t fret. Everyone looks at social media for “inspiration,” whether they realize it or not. Whatever your motivation may be, we’ve gathered twenty of the best Instagram accounts operated by professional writers (or about or related to professional writing). Whether you’re out to follow interesting feeds or build a bigger audience for your own Instagram, these social media moguls will give you a glimpse into the writing lifestyle and inspire you through their own creativity. It’s a simple formula: Kate Gavino scours New York for book readings by visiting (or local) authors. 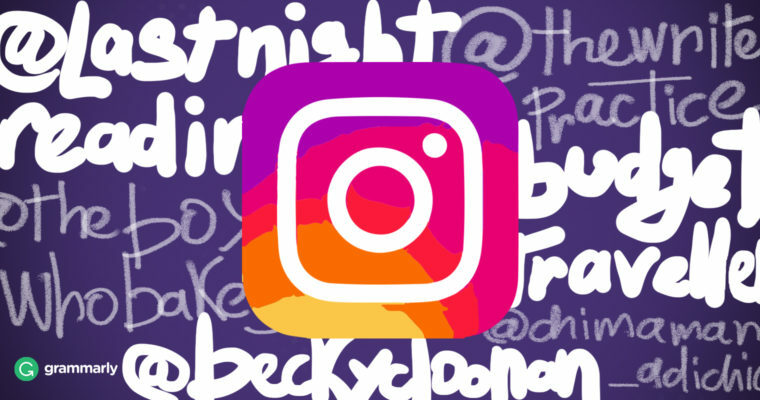 Then, she cartoons the author, picks one of her or his quotes, and posts it on what the cool kids call “Insta.” The result is a colorful and interesting feed that will help you get to know authors and provide regular doses of inspiration. And if that’s not enough for you, there’s Gavino’s matching book, Last Night’s Readings: Illustrated Encounters with Extraordinary Authors. A website dedicated to the craft of writing—whether blogging, marketing, fiction-writing, or posting on Instagram—the Write Practice’s account includes inspiring quotes, sales on writing aides, and links to their blog with deeper writing advice. We were born with stories to tell. K.M. Weiland is an author (duh), and she posts advice for other authors. In addition to writing historical and speculative fiction, she is also the author of Outlining Your Novel and Structuring Your Novel. Weiland’s instagram feed is uniquely crafted for writers of creative fiction. Next time you have writer’s block, give it a visit, and don’t forget to check out her blog Helping Writers Become Authors. Paulo Coelho is best known for his novel The Alchemist (which, a recent post reminded us, is the third best-selling novel of all time, after only Don Quixote and A Tale of Two Cities). His feed is a blend of inspiring quotes, Coelho in nature, and interesting art and scenery the writer wants to share with his 1.4 million followers. 40 years ago today, on May 3, 1977, I was dropped off on a remote Alaska beach. 3 days later, after skiing 30 miles up the Baird Glacier, alone, I pitched my small tent right here, on the Stikine Icecap, and took this photo of the mountain I’d come to climb–the Devils Thumb. Adichie is a Nigerian author who has made it onto several lists of authors under forty and has won awards for her books Half a Yellow Sun, The Thing Around Your Neck, and Americanah. Her writing bridges Nigeria and the United States and, in addition to telling powerful stories, touches on issues of race, identity, and feminism. Her Instagram takes another tack with the project “Wear Nigerian,” in which Adichie appears in fun, bright clothes by Nigerian brands and designers. Her Instagram should be a hit for fashion followers and author enthusiasts alike. “Future Chris” is the deputy editor at Mashable and he wrote How Star Wars Conquered the Universe. His Instagram is chock-full of quirky pictures, quotes about writing, extreme nerdery, and (inevitably) his cats. Pulitzer Prize–winning author of novels including The Mysteries of Pittsburgh, The Amazing Adventures of Kavalier & Clay, and The Yiddish Policemen’s Union, Chabon takes goofy selfies and shots of funny or interesting things he comes across, from favorite comic book illustrations to a Medusa head in a museum to his toddler in a Darth Vader mask. It’s a fun insight into the mind of a prolific creative writer. A feed to match the book of the same name, Adventure Cats features—you guessed it—pictures of cats on adventures. With the tagline “Living 9 lives to the fullest,” the feed has a great dose of humor and plenty of puns to accompany photos that deserve your follow whether your thing is cats or travel. Kash Bhattacharya has been recognized both for his travel writing and his great ’gram. His fabulous photos complement his blog, which includes stories about his destinations and tips for traveling on a budget. Is it travel or is it food? Girl Eat World gives you a dose of both, with tasty morsels posing in front of hot and cool destinations the world over. Whether you’re in it for the skewer or the skyline, you’re bound to get a taste of inspiration with this follow. A journalist and long-time op-ed columnist for The New York Times on issues of human rights and social justice, Kristof has a particularly powerful feed, including pictures of his travels around the world to explore social issues and connect with people of all stripes. Along with photos of people and stories from around the world, there are some great nature shots, book-signings, and dogs in meadows thrown in for good measure. Congrats to these graduates today of the Kibera School for Girls kindergarten, in Kenya's largest slum. Addario’s photographs capture human rights issues, poverty, and the aftermath of violence, with occasional food and family photos. Addario’s memoir, It’s What I Do: A Photographer’s Life of Love and War details her life as a photojournalist and the trials of being a female photographer documenting wartime Afghanistan and other conflict zones. Her Instagram is a taste of that, and more. Randy Olson and his wife Melissa Farlow have traveled the world to photograph people and places of all kinds for over twenty years. You may have seen their stories in National Geographic, but you can browse their striking photos on their shared website, too. And of course, Randy’s Instagram runs the gamut, from shots of forked lightning to strangely picturesque piles of corn to diverse social events and celebrations from all over the globe. If you haven’t yet been hooked by the reality cooking show The Great British Bake Off, start out by getting hooked on (spoiler alert) its season one winner Edd Kimber’s Instagram. Kimber is a writer, stylist, and host of the podcast Stir the Pot, and in his spare time, shares photos of crafty confections like these salted chocolate and pistachio babka buns. Delightful and decadent though salted chocolate and pistachio babka buns may be, if you’re more of the health-food persuasion, check out the power couple Kezia and Jared. They blog about their healthy food habits and have a feed of foods that look healthy yet delicious to match. Yes, that can still mean donuts. (Or is it doughnuts? Grammarly knows the spelling secrets). Sending out lots of doughnut orders to people today! If you're newer to following us, we run a small bakery out of our kitchen supplying locals with paleo treats! I love getting to put a cleaner option into people's hands ? and provide fun options for people who can't eat gluten/grains/dairy! If you're in Redding and want to order or you're passing through just shoot me an email kezianeusch@gmail.com. ? . . The recipe is also in #thewholedoughnut ebook on Amazon and on our blog via the link in our bio! A writer for Channel 4 News and Great Taste Award judge, U.K.-based Spector is well qualified to wow with her food pics. Next time you’re in London, use her feed to find food for yourself at London’s top spots. Or if you’re not planning a trip to Jolly Ol’ Londontown, admire the creative foodstuffs Spector so spectacularly photographs. Rainbow croissant by the genius that is @sbpatisserie at @hotelcaferoyal with a spoonful of cherry jam. It has turned into one of those hectic days in the newsroom with Trump tweeting all sorts and a cyber hack on the NHS. So I'm seeking a moment of solace in layers of flaky rainbow pastry joy. ?????? Staples is best known for her work on Saga and Rat Queens, both award-winning comics series, though she has also drawn for Archie. She posts finished illustrations (speech bubbles and all) from comics she’s worked on, as well as sketches she’s done just for fun. It’s a great feed to follow if you want to see great illustrations and the process of creating it. He was an animator for Disney. Then he started drawing for Marvel, DC, Image, and Dark Horse. If the credentials aren’t enough, let his art speak for itself. He posts images from comic books he’s working on (including The Avengers, The Infinite Horizon, and various Star Wars comics), sketches in progress, and other art that will wow you. Working on my last Jyn ? If you’ve heard of Batman or Conan the Barbarian, you’ve probably seen work by Becky Cloonan. On her Instagram, you’ll see work from her big, mainstream titles as well as smaller publishers and marketing posters, plus the occasional casual pic of a concert, vacation, or burger. Expect plenty of skeletons, fairies, and supernatural scenes. So stoked to finally be able to show the poster I did for LOGAN! Can't wait to watch this movie. I love drawing brooding men so this was a lot of fun! With that diverse crowd of Instagrammers, you should have plenty of art, food, international hot spots, and inspirational quotes to get you thumbing through your day. And if that’s not enough for you, there’s always Grammarly’s quirky mix of wordplay, writing tips, and the best animals ever.